Child development appears to be one of the most studied phenomena of human development, especially with regard to cognitive and biopsychology. In the nineteenth century, child development attracted both philosophers and psychologists and, this can be attributed to the intrinsic nature of the topic because; it encompassed numerous mysteries and controversy. Ordinarily, childhood is usually accompanied by transient developmental changes, which are governed by the child’s inherent biological characteristics and the ambient social conditions in the neighborhood. As such, the phenomena of child’s development can be approached from diverse perspectives and, this was the case in the early nineteenth century when a number of prominent scholars studied the issue and hypothesized different theories on child development. For instance, Jean Piaget and Lev Vygotsky were among the most prominent scholars who contributed significantly to the advancement of studies on child development through postulating reliable theories although their principal postulates exhibit variations. Slanders (2009) remarks, “Swiss philosopher Jean Piaget and Russian psychologist Lev Vygotsky each developed their own ideas of child development” (par. 1). Nevertheless, theories developed by these two theorists have been useful to teachers and parents in enhancing learning and growth of children. Slanders (2009), reaffirms, “Piaget and Vygotsky contributed heavily toward the field of child development. Even though, their theories are fundamentally different, teachers and parents can incorporate both as they help their students and children learn and grow” (par. 3). 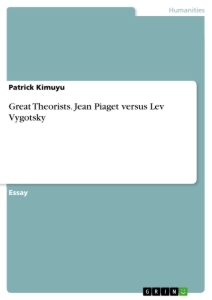 Therefore, this research paper will discuss the significant similarities and differences between Jean Piaget and Lev Vygotsky. It seems quite interesting to learn that these two renowned theorists were born at the same time, although their lifespan was different and, their socio-cultural background and source of motivation were quite different; hence their diverse perception on child development. Jean Piaget, a psychologist was born in Switzerland, in 1896 and, he is known to have possessed immense biological orientation. In his postulates, it appears evident that Piaget believed that change and transformation were the key determinants of knowledge, implying that his perspective on child development was based on operative knowledge. In other words, Piaget’s constructivism perspective portrays the learning process as construction (Blake & Pope, 2008). In his investigations on students; wrong responses, Piaget identified four fundamental stages involved in cognitive development: formal, sensori-motor, concrete and pre-operational, and he explained the significant cognitive changes in each developmental stage. In regard to the sensori-motor stage, also referred to as the infancy stage, children develop knowledge through the use of the five senses and goal-directed actions and they experience an unprecedented egocentrism because; they do not incorporate other peoples’ perception on their perspectives like adults. In the pre-operational stage between two and seven years of age, children develop language, and they can solve one-step logic problem. However, the element of egocentrism remains conspicuous in the child’s responses. In seven to eleven years, the child shades off egocentrism and manifest substantial cognition in conversations, whereas in the formal operations stage; twelve years to adulthood, enables children to manifest logical thinking (Blake & Pope, 2008). Lev Vygotsky, a philosopher was born in 1896 in Russia and, he was fundamentally history and philosophy oriented. He believed that the child cognitive development was attributable to the socio-cultural environment, in which the child developed, and his investigations into the issue were greatly influenced the Marxist Theory, which states, “…historical changes in society and material life produce changes in human nature” (Blake & Pope, 2008 p. 60). He focused on the principal precepts of cognitive learning zones. In his investigations, Vygotsky designed postulates with regard to the Zone of Actual Development (ZAD) and the Zone of Proximal Development (ZPD). The Zone of Actual Development occurs when children manifest abilities to execute their tasks on their own successfully, especially at circumstances where the child does not require learning new ideas. On the other hand, the Zone of Proximal Development involves the learning of new ideas by the child; thus, assistance from peers and adults is quite essential in knowledge development (Blake & Pope, 2008). Vygotsky described the Zone of Proximal Development as the distance between the actual mental development and the potential development, especially with regard to problem-solving abilities (Fernyhough & Lloyd, 1999). The constructivist theories of Piagetian and Vygotskian encompass some fundamental aspects of the child cognitive development. These theories are relatively similar but, they manifest relevant differences. LeGard (2004) states, “Jean Piaget (1896-1980) and Lev Vygotsky (1896-1934) proposed the classical constructivist theories of cognitive development, although often compared; the concepts differ significantly” (p. 1). For instance, Piaget’s focuses on child cognitive development with regard to time; thus, the stages are described as hierarchical in nature. As such, a child is ought to complete the stages in a sequence, in which the cognitive development begins with the sensori-motor stage and progresses to the pre-operational stage. Thereafter, the child enters the concrete stage characterized with independence in the expression of ideas followed by the formal operations stage, in which the child assumes adult thinking. It is worth noting that, in Piaget’s perspective, cognitive development in children at most stages do not involve social interactions as significant elements of knowledge development. On the other hand, Vygotsky’s perspective emphasizes extensively on social interactions, especially with regard to the role of assistance to the child during the developmental stages. He reported that, children acquire extensive knowledge from knowledgeable peers and adults, especially through communications and peer interaction (Slanders, 2009). Concisely, Piaget portrayed child cognitive development as an adaptation process, in which continuous progression of accommodation and assimilation play fundamental roles in knowledge development. On the other hand, Vygotsky describes the process of cognitive development as a product of an appropriation of the child thinking pattern, in which the child learns from competent individuals during their social interactions. However, it is noting that Piaget and Vygotsky agree universally on the constructive aspect of intellectual development (LeGard, 2004). The Depiction of Torture in Jean Améry's Essay "Die Tortur"
An Enhanced Reading of Jean Rhys' "Wide Sargasso Sea". Considering Source Texts Other than "Jane Eyre"
A Visual Analysis of Jean-Léon Gérôme's "The Muezzin's Call to Prayer"
A Setting Analysis of Jean Rhys’ "Pioneers, Oh, Pioneers"
Man Doll and Woman Doll Strike Back - The De-construction of 1960s American Consumer Culture in Jean-Claude von Itallie´s "Motel"